The Laffer Gallery is proud to present Woodcuts and Sculpture, a two-person exhibition with artists Allen Grindle and Mary Pat Wager. Join us for an opening reception on June 4th, from 5-8pm. Allen Gindle’s dynamic woodcuts speak powerfully to the constant change in nature and the human condition. Mary Pat Wager carefully assembles objects made from diverse materials – a mix of personal, historic, industrial and natural – into sculptures that explore the interplay between visual and psychological relationships. Allen Grindle received his Bachelor of Arts from the University of Maine at Portland-Gorham in 1973 and attended the Skowhegan School of Painting and Sculpture in Maine. After graduating college, he received his Master of Arts (studio art) from the State University of New York in Albany, New York in 1978. Over the years Allen Grindle has produced many works of art including sculptures, black and white prints, and paintings. Allen has been featured in many shows all over the world including the First International Printmaking Triennial of ULUS at the Art Pavillion at Kalemegdan in Belgrade, Serbia and the SAGA (Society of American Graphic Artists) Members’ Exhibition, Prince Street Gallery in New York, New York in 2011. The 4th International Digital Mini-print Exhibition at the Center for Visual Artists Voice in Ottawa, Canada in 2009. The Allen Grindle: Woodcuts and Sculpture at the Koussevitzky Art Gallery, Berkshire Community College in Pittsfiield, Massachusetts and the Then and Now at the Albany Center Galleries in Albany, New York in 2006. Her work has been exhibited nationally and internationally. She has received numerous awards for her work in sculpture. These include a National Endowment for the Arts grant and representing the United States with her work at the Small Works International Exhibition in Budapest, Hungary. She lives and works in upstate New York. The Laffer Gallery is proud to announce Space + Volume, bringing together artists Robert Gullie and Gyula Varosy in a dynamic exhibition that stirs our emotions and understanding of form, function, space and volume. This exhibition will open February 27th with an opening reception from 5-8pm, and be on view through April 3rd. Gullie’s vibrant, surreal collages and Varosy’s bold abstract, figurative sculptures reflect one another. The figure is a central reference in their pieces, where it can take on many forms and shapes, from the obvious to a most fleeting gesture, affinity, or association of forms and relationships – together, their works unveil unique narratives waiting to be explored. Robert Gullie of Cohoes, NY creates in the mediums of mixed media collages, hand-tinted photography and in the photopolymer gravure printing process. Gullie’s work has been included in over eighty exhibitions including over twenty-five solo exhibitions. He is the recipient of numerous awards a NYFA Arts Residency Project Grant; the Gilliand-Weinheimer Oakroom Artist Award; 1st place in the photography category from Columbia County Council of the Arts and was named “Best Photographer” by Metroland Magazine (1997). His work has also been included in the permanent collections of The Kinsey Institute, University at Albany Art Museum, Mohonk Mountain House, Frances Kinnear Museum, Albany Medical College and the historic Mission House in Stockbridge Massachusetts in addition to many private collections. He has been commissioned by the Saratoga Performing Arts Center (2010-2013) to create images for such celebrated arts organizations as The New York City Ballet, Philadelphia Orchestra and MOMIX Botanica. His work has also appeared on the covers of several regional periodicals and has been used as cover art for a number of CDs. Gyula Varosy was born in Hungary and came to the United States as a refugee in 1957. After receiving degrees in Architecture from Pratt Institute and Harvard University, he lived and worked in New York City, with a concentration in housing design. He moved to Greenwich, New York in 1990, when sculpture finally became his main focus. He has exhibited at various galleries in the northeast, including the Southern Vermont Arts Center, New York University, and the Lichtenstein Center for the Arts. Featuring Ann Larsen, Anne Diggory, Ben Schwab, Carolyn Kibbe, Catherine Wagner Minnery, Cheryl Horning, Chris DeMarco, Chris Duncan, David Waite, Gary Larsen, Gordana Vukovic, Harry Wirtz, Ian Creitz, James Sankowski, Janet Marie Yeates, Janice Medina, Jim Flosdorf, Jackson Bryant, Karen Elem, Linda Hinkle, Linda Motzkin, Mary Pat Wager, Matthew Hopkins, Michelle Winnie, Rachel Nolte, Regis Brodie, Rob O’neil, Russell Serrianne, Sarah Pezdek and Takeyce Walter. We are excited to officially announce the featured artists for our 4th annual juried group show entitled “Upstate Artists” for the 2015 Holiday Season. “Upstate Artists” features a diverse cross section of the Upstate New York arts community. Exhibited work was chosen from over 130 entries in response to an Open Call for Submissions to local artists. 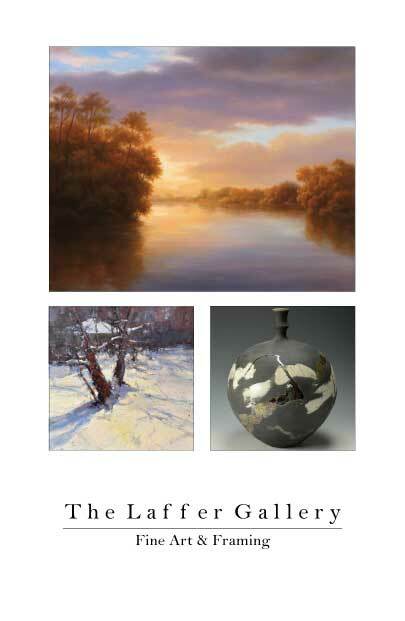 Please join The Laffer Gallery and our selected artists for an opening reception on Saturday, December 5th from 5pm until 8pm for an opportunity to meet the artists and view their amazing work. Ann Larsen, Anne Diggory, Ben Schwab, Carolyn Kibbe, Catherine Wagner Minnery, Cheryl Horning, Chris DeMarco, Chris Duncan, David Waite, Gary Larsen, Gordana Vukovic, Harry Wirtz, Ian Creitz, James Sankowski, Janet Marie Yeates, Janice Medina, Jim Flosdorf, Jackson Bryant, Karen Elem, Linda Hinkle, Linda Motzkin, Mary Pat Wager, Matthew Hopkins, Michelle Winnie, Rachel Nolte, Regis Brodie, Rob O’neil, Russell Serrianne, Sarah Pezdek and Takeyce Walter. Artwork for this exhibition was selected by John Van Alstine. Van Alstine received his MFA from Cornell University and his BFA from Kent State University. He primarily creates abstract stone and metal sculptures. His work has been exhibited in museums and galleries throughout the US, as well as Europe and Asia. Van Alstine has been awarded fellowships, grants and citations from the Pollock-Krasner Foundation, Adolph and Esther Gottlieb Foundation, National Endowments for the Arts, Yaddo Fellowship, The Louis Comfort Tiffany Foundation, New Jersey Council of the Arts, and the Merit Award in Beijing for his construction of a large-scale public sculpture in the Olympic Park Garden. SCHUYLERVILLE, N.Y., October 14, 2015 – The Laffer Gallery today announced the date for its upcoming exhibit 3rd Annual Upstate Invitational. With artists Mary Ellen Riell, Chad Smith and JoAnn Axford. These distinguished artists were honored with last year’s 3rd Annual Upstate Artists Best In Show Award, juried by Paul Hobart, and invited to exhibit their works in this dynamic new exhibit at The Laffer Gallery. We invite you to join us opening night on Saturday, October 24th from 5pm – 8pm for an evening of fine art, lively conversation and hors d’ oeuvres. 3rd Annual Upstate Invitational will be on view through November 29th. Mary Ellen Riell – A former professional illustrator and college instructor, Mary Ellen Riell received her art training at the Art Student’s League in New York City, the Fashion Institute of Technology, and Brooklyn College, where she studied with painter Sam Gelber and sculptor Sylvia Stone, before receiving a Master’s degree in art education from the College of Saint Rose in Albany, NY. Chad Smith – Chad Smith prefers a direct yet studied approach to plein air painting. It has been said of his work: “Not just ‘a scene’ but a real statement about something, yet not forced or melodramatic.” Smith has gallery representation in New York, Colorado, Florida, South Carolina and is collected internationally. The Laffer Gallery today announced the date for its upcoming “A Delicate Balance” art exhibition. Featuring artists Ann Larsen, James Sankowski, Mark Tougias and George Van Hook, the exhibit will open Wednesday, September 16, and run through Sunday, October 18. An opening reception will be held Saturday, September 19. Ann Larsen is an accomplished oil painter who received the 2014 Award of Excellence at the Paso Robles Invitational. She has been featured as an “Artist to Watch” by Southwest Art Magazine and is a signature member and past president of American Women Artists. She is also a member of American Impressionist Society, Outdoor Painters Society, Rocky Mountain Plein Air Painters, Oil Painters of America and Laguna Plein Air Painters Association. James Sankowskie is a potter from Ballston Lake. His pots create a balance between form and design to yield pottery that is both durable and functional. Sankowskie has exhibited work in numerous regional, state, and national shows and art fairs, and his pottery has appeared in such publications as Studio Potter, Ceramic Monthly, and The Art of Contemporary American Pottery. Mark Tougias is a self-taught artist whose inspiration comes from his immediate surroundings in Vermont and upstate New York. His work is defined by the use of light, tonality, atmosphere and composition to depict the poetic and spiritual qualities of place rather than an exact rendering of location. Tougias has exhibited in more than 40 galleries and has had more than 25 one-man shows. George Van Hook has been exhibiting his paintings for more than 35 years throughout the United States, Europe and Japan. Van Hook’s painterly style follows in the tradition of the impressionists. Inspired by both a love of nature fostered by long hours painting “en plein air,” he paints with gusto and passion, bringing freshness and immediacy to the rural scenes where he lives in upstate New York. His work has been featured in En Plein Aire Magazine and he has twice been featured in American Artist Magazine. The Laffer Gallery is proud to announce, Double Vision, with painter Jenny Kemp and sculptor Caroline Ramersdorfer. Double Vision captures the nuances within the artists intricate abstractions and translucent layers, leaving the viewer to experience simultaneous perceptions within the works. Jenny Kemp’s interest in abstraction comes from her desire to create images that serve to represent unseen phenomenon. The results are paintings that are dense, intricate and often abstruse. Biologically-inspired imagery, stemming from contemplations on our relationship to organic matter is built through lines and planes of subtly shifting hue intensities and gradations, generating form through a slow additive process of layering line work by hand that parallels growth and changeability in the natural world. These investigations are furthered by capturing macro shots of her paintings and manipulating them into small stop-motion videos, which spark a conversation about the tensions between depth and flatness, movement and stillness, handmade and digital. Jenny Kemp received her Bachelors degree in studio art from the University of Wisconsin – Madison and her MFA in Painting from the University at Albany. Her work has been exhibited in galleries and museums across the country, most recently at Kenise Barnes Fine Art in Larchmont, NY, a two-person show at Middle Tennessee State University and an invitational exhibition at The Painting Center in NYC. She has been featured in publications such as 100 Painters of Tomorrow published by Thames & Hudson, The Huffington Post, Seattle’s City Arts, LUXE, NY Times, Fabrik, and Apogee magazines. She is the 2015 recipient of The Arts Center of the Capital Region’s Emerging Artist Award. She is also currently a Visiting Professor of Studio Art at Middlebury College in Middlebury, VT and sits on the board of Collar Works, a not-for-profit, artist run exhibition space in the Capital Region of New York. Caroline Ramersdorfer’s sculptures are expressive abstractions capture light through delicate, translucent layers of marble to convey the passage of time and evoke an emotional response from the viewer. Symbolism and cross-cultural references are important to her work, representing an interior world both physical and spiritual, something she called architecture of the soul. Since moving to the Adirondacks, Ramersdorfer has found inspiration in her rural environment. Her work has opened up, breaking through the rigid angularity of her earlier work into more expressive abstractions. With nature more of a guide, the new works provide a refreshing fluidness and unpredictability. Caroline Ramersdorfer studied philosophy in Paris in 1979, before enrolling in the International University of Art in Florence, Italy, where she studied African art history, museum science, and Renaissance fresco restoration. She received her MFA in sculpture in 1988 from the Academy of Fine Arts in Carrara, Italy. After completing her studies, Ramersdorfer’s career took off, thanks in part to grants from the Austrian Federal Ministry of Education and the Arts and Culture and the Federal Chancellery in Vienna to work abroad, most notably in Japan in the early 1990s. A grant from UNESCO supported the Carambolage Project, a 1998 exchange with artists of the Caribbean. In 1995 she returned to Austria where she established studios in Vienna, and in Vorarlberg, in the home designed by her father, the architect Mag. Willi F. Ramersdorfer (1922-2010). Over the next few years, she worked in both Asia and Europe on the Energy series, developing the Ring Project in Fukuoka, Japan, and the Inner View series in Vienna. Since then, she has participated in exhibitions worldwide and won commissions to create a number of large-scale, site-specific works at nearly two dozen international sculpture symposia. Her sculptures are installed in private and public art collections in Europe, Japan, Taiwan, Egypt, Canada, U.S.A., China, Belize, Abu Dhabi and Dubai, United Arab Emirates, where she was awarded first prize at the 2005 Emaar International Art Symposium for Inner View. In early 2009 Ramersdorfer was one of 17 artists participating in the Abu Dhabi International Sculpture Symposium. She produced a 15-ton sculpture in white marble, which took five weeks to create. After spending summers in the Adirondack Region of upstate New York, Ramersdorfer became a permanent resident of the US in 2009 and has a studio in Wells, New York. The Laffer Gallery is proud to announce its upcoming exhibition. From The Earth unites three artists, Jane Bloodgood-Abrams, Valerie Craig and Jill Fishon-Kovachick, inspired by the natural world around them. Join us for the opening reception on Saturday, May 16th from 5-8pm. Influenced by the great 19th century artists who visually glorified this region, Jane Bloodgood-Abrams creates a fresh view of the landscape. Inspired by dramatic, and transitory moments, a deep connection to nature is formed through color, composition and iconographic imagery. Using layers of glazes over time, Bloodgood-Abrams embodies the emotional essence of the scene, through the veil of memory. Painting en plein air as much as possible, Valerie Craig’s oil and watercolor paintings become suffused with soft light, evoking an emotional response and remaining sensitive to the mood and atmosphere of a particular scene. Whether painting in vast open areas or intimate spaces, through close observation, Craig captures incredible light and color. Ceramic artist Jill Fishon-Kovachick utilizes Raku, Sagger and High Fire techniques to create subtle, yet resplendent tones and natural coloration of earth and sky in her work. Jane Bloodgood-Abrams, received her Master of Fine Arts degree from the State University of New York at New Paltz, and a Bachelor of Studio Arts degree from the College of Saint Rose in Albany, NY. Bloodgood-Abrams’ work has been chosen for many regional, national, and international exhibitions, including the New York State Biennial, The Mohawk -Hudson Regional, The Bienniale in Florence Italy, as well as exhibitions in Austria and Germany. She has been an Artist in Residence through the Catskill Center and was selected for a Rhine-Hudson Artist Exchange in Cologne, Germany. Bloodgood-Abrams has received grants from the Ludwig Vogelstein Foundation, the New York Foundation for the Arts, and was recently a semifinalist for the $20,000 Basil H. Alkazzi Award for Excellence. Her works are included in numerous corporate, museum and private collections. Having drawn and painted nearly all her life, Valerie Craig left her nursing administration career in 1998 to pursue her passion for painting and for the outdoors. Craig travels frequently to Ireland and within the United States, teaching workshops, seeking inspiration and opportunities in the field. Honors include the Artists’ Choice Award in the 2010 Easton Plein Air Festival, First Place in the 2009 Wayne Plein Air Festival, Runner Up to Best in Show in the 2009 American Women Artists Show, and Best in Show in the 2008 Wayne Plein Air Festival. Craig lives in St. Davids, Pennsylvania with her husband Peter. Jill Fishon-Kovachick is a renowned local clay artist and owner/director of the Saratoga Clay Arts Center located in Schuylerville, NY. The Laffer Gallery is proud to announce its upcoming exhibition Stone| Steel Paper, a solo exhibit featuring John Van Alstine. This exhibition will run April 8 – May 10, with an opening reception on Saturday, April 11th from 5-8pm. Join us for a wonderful evening of thought provoking art, hors d’oeuvres and conversation. John Van Alstine, widely known for his large scale outdoor sculptures made from stone and found object steel, has notably become one of America’s most important sculptors over the past decade. For more than thirty-five years, the focus of Van Alstine’s sculpture has been the exploration of motion and balance through the natural forces of gravity and inertia, as experienced in his monumental, large scale and smaller works located in Asia, Europe, the Middle East and North America. The combination of natural elements with the man-made creates a poetic and choreographed visual balance, often referencing figurative, classical, nautical, celestial and western mythological themes. Van Alstine, born in 1952 in Upstate New York. He received his BFA from Kent State University and his MFA from Cornell University in 1976. Since then he has participated in more than 80 solo and group exhibitions and has won numerous awards, fellowships, and grants from the Pollack-Krasner Foundation, Gottlieb Foundation, National Endowment for the Arts, the Yaddo Fellowship, the Louis C. Tiffany Foundation, New Jersey Council of the Arts and most recently the Merit Award in Beijing for his construction of a large-scale public sculpture in the Olympic Park Garden. Since 1970s, his sculpture has been reviewed in several publications such as the Washington Post, Baltimore Sun, USA Today, New York Times, Art in America, Art Forum, Art News and Sculpture Magazine. The Laffer Gallery today announced it will hold a closing reception for the “Matter of Form” exhibition on Friday, March 27, at The Laffer Gallery on 96 Broad Street in Schuylerville, N.Y.
“Due to inclement weather throughout the exhibition, as well as a snow storm during the opening exhibition, I wanted to give our patrons a final opportunity to view this great collection of artwork,” said Erik Laffer, owner, The Laffer Gallery. The exhibit features artists Timothy Kadish, David Miller & Gary Zack. Hours for the reception are 5 p.m. to 7 p.m. Refreshments and hors d’oeuvres will be served. The Laffer Gallery is proud to announce its upcoming exhibition Matter of Form, with artists Timothy Kadish, David Miller & Gary Zack. This exhibition will run February 21- March 29, with an opening reception on Saturday, February 21 from 5-8pm. Join us for a wonderful evening of thought provoking art, hors d’oeuvres and conversation. Matter of Form showcases three artists who embrace form as a way to unite the visible elements in their works, such as color, light, line, shape and dimension. Timothy Kadish’s paintings embody a space of becoming: a diagram and structure for the gathering of matter, represented as signs and symbols. Painting from the premise of research, exploration and communication, Kadish is inspired by atomic structures, graphic image, diagram, mathematics, biochemical formulae or written languages, and is driven by the eagerness to clarify his relationship with the creative condition. David Miller’s whimsical and dreamlike paintings investigate the phenomenon of time and memory, and its relation to gravity. Gestural layers interact to suggest fragments of reality, while curious shapes and marks express visual, emotional, sociological or text-based events significant to the artist’s narrative. The resulting chaos becomes a visual fantasy much like a puzzle waiting to be solved. Gary Zack’s impressive glass pieces encompass rich colors and luxurious forms. His love of hot glass is founded on the immediacy and spontaneous nature of the material, as well as the interplay of color and light. Zack makes handblown glass vessels, vases and sculptural installations in his Saratoga Springs, NY glassblowing studio. Timothy Kadish received his MFA from Boston University and is a graduate of the Diploma and 5th Year Certificate programs at the School of the Museum of Fine Arts. He has exhibited nationally and has been published in numerous arts related sources. Kadish’s most recent selected exhibitions are New Paintings at The Clark Gallery in Lincoln, MA and at Alphonse Berber Gallery in Berkeley, CA. David Miller, Professor Emeritus at Skidmore College, received his BFA from The School of the Art Institute of Chicago and his MS in painting from the University of Wisconsin. Miller, one of the most well-known and respected artists in upstate New York is included in a wide range of both public and private collections, including Carnegie Museum of Art, School of The Art Institute, Key Bank Headquarters, Pepsico Corporation, Siena College, among many others. His work had been exhibited in numerous solo and group exhibitions, including a retrospective at the Tang Teaching Museum, exhibits at The James Gallery in Pittsburgh, PA and The Stephen Haller Gallery in New York, NY. Recently, Miller has exhibited his works at The Arts Center Gallery in Saratoga Springs, NY and at The Albany Institute of History and Art in Albany, NY. His works are represented by Sorelle Gallery and The Laffer Gallery. Gary Zack has been involved with glass since 1978, as a successful commission stained-glass artist and, more recently, as a blown glass artist, in Upstate New York. Zack has been involved with blown glass since 1990, and is mostly self-taught. The Laffer Gallery will be closed beginning Monday, January 21, and will reopen on Saturday, February 21. NOTE: Private consultations and viewings are still available by appointment during this time.